Packing begins. I ran all over town to find five matching red suitcases, five matching neon yellow t-shirts, and five matching fluorescent bathing suits. These kids will be hard to miss. Jack is nervous. He’s showing signs of anxiety; worried pacing, wild gesturing, and overall restlessness. I came into the kitchen in time to see him jabbing his finger in the air with an animated expression. I asked him who he was talking to and he said “Nikki”. I thought maybe he meant “Mickey”, as in mouse, but when I pressed him further he repeated “Nikki.” We don’t know a Nikki, so I asked him who she was. “I can’t tell you. No one. Don’t ask”, he intoned. Long day of travel. We left the house at 6:15 to head to the airport, arrived in Orlando at 12:30. Took a car service with a driver named Leo to the ship. Jack kept asking Leo if he had a driver’s license. “Do you even know how to drive?” he sneered, agitated by the final leg of the trip. Mid-afternoon we boarded the cruise with much fanfare and music. The kids are thrilled, even Jack. He is, however, keeping a watchful eye for wandering characters and we heard him chanting “Just humans in costume, just humans in costume” to himself. 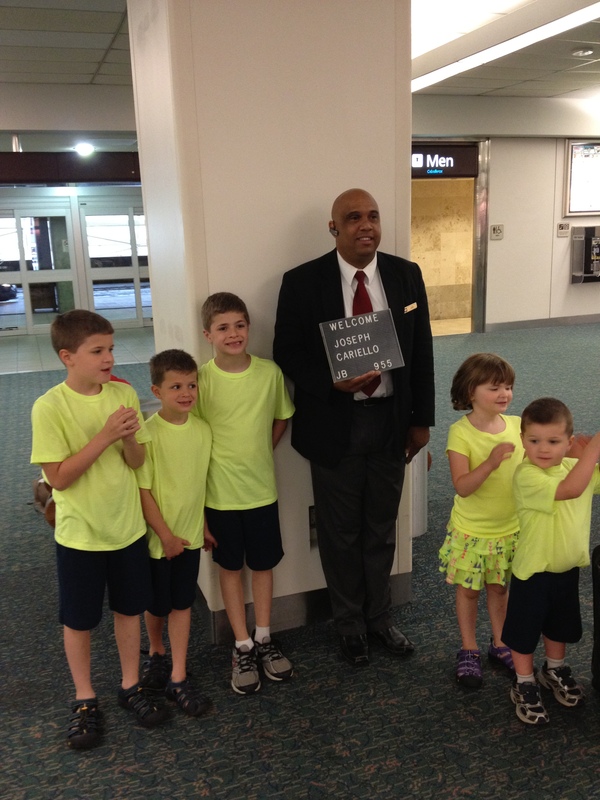 This morning before breakfast I brought Rose downstairs to the grand lobby for the princesses’ scheduled appearance. Eyes shining, she took in the scene of glittery dresses and sparkling tiaras. When I suggested we hop on the line to get her picture taken she said in her husky voice, “Nah. Let’s go eat breakfast with the boys.” I agreed with my delightful girl; I’ll take syrupy pancakes over syrupy princesses any day. Today we docked in the Bahamas and left the ship to tour the Atlantis resort. Riding the rickety Bahamian shuttle over the bridge towards Atlantis, the overcast day turned ominously dark. As we followed the tour guide through the gardens and fish ponds of the estate-like property, the skies suddenly opened up and released buckets of rain with cracks of lightning and thunder. And then as quickly as it began, the storm ceased. We were shaken. And wet. During the afternoon I lost Jack. There one minute and gone the next, just like they tell you. I felt physically sick as I circled the wading pool, searching, searching, searching for him. At last I glimpsed his bright yellow bathing suit weaving in and out of the crowd. I charged up to him, scolding and hugging and asking where he’d been, where he’d gone. He answered nonchalantly, “I wanted to see things. I’m a big boy now.” Turns out he’d gone on a water slide called The Challenger. Alone. (Well, I’m assuming Nikki went too, but still. She’s not shaping up to be much of a chaperone.) I burst into tears. I’m not sure which makes me feel worse; his new phobia of thunderstorms or that I bought him Crocs and they make his kankles look even bigger and more kankly-er. Shrieking aside, a fun and relaxing day. 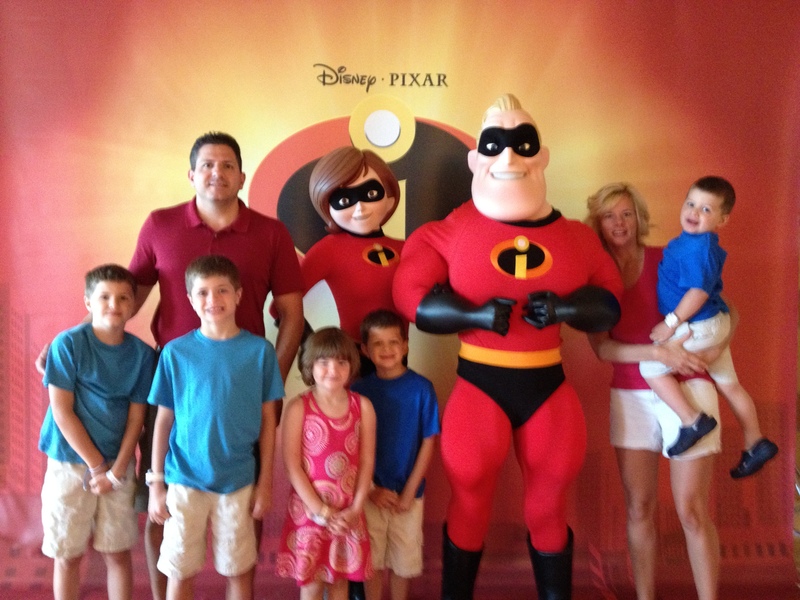 Just before dinner we posed with the Incredibles. At the last second Jack agreed to stand with our family for the picture. Pretty incredible. Back to the beach today. Kids had a ball swimming and catching hermit crabs. When we returned to the boat Joey begged to go to the kids’ club for the evening. We were suspicious of his enthusiasm; turns out he met a girl there. Our spirits were buoyed – maybe we’ll marry one of these kids off yet. We sent them all to the club for the night and hoped they’d each meet a future spouse. Ate in the adult dining room, had the best chocolate soufflé ever. Late last night, after chocolate soufflés and martinis and kids’ club, we realized Disney expects us to remove our arses from this ship by 7:30 in the morning so they can begin boarding the next crowd. Our flight home wasn’t scheduled until 2:30 in the afternoon. Panic set in. On the way to the airport, Joe called Jet Blue to see if we could get on the 9:20 flight. Miracle of all miracles, they had seven seats available – we were saved from the desperate circumstances of keeping five small people busy in an airport for six hours. Only glitch was we had to get the same small people – one who decided “I a puppy now! I only crawl on the floor!” – through check-in and airport security in a half hour or risk missing the plane. We made it with six minutes to spare. I was worried about the boys flying on their own, halfway down the plane from us. When the seatbelt light went off I rushed down the aisle to check on them. Each sported a pair of silver wings on their shirts, courtesy of the flight attendant, and they were enjoying large sodas and cookies. Jack introduced me to his seatmate: “This is Hannah. She has a diet coke and a cup with three ice cubes in it.” I glanced over at Hannah, who refused to meet my eye, and suggested to Jack that maybe he’d like to switch seats so we could sit next to each other. I scurried back up the aisle and ducked my head so Henry wouldn’t clamor for me. I settled in with my own diet coke and finished Little Bee. Great book and great way to end a family vacation: alone. At 2:00 we walked in the door. Joe collapsed face down on the couch while five yellow-clad children dragged in one red suitcase apiece. All in all, a successful trip. One giant leap for our family, a few small steps for a big boy with autism. And a free vacation for Nikki. Carrie!!!! I was so happy to hear about your trip! You have such a way with words that kept me laughing and feeling like I was on GE trip with you. The kids will not forget this trip! Glad you’re home. sounds like a great , memorable trip – glad all went well!